In the last 144 months, or since 2005, there has been no decreasing trend in Arctic sea ice. In fact, there has been a slight increasing trend. Since the 21st century began, nearly all of the increase in Arctic-wide temperatures occurred between about 2001 and 2005. 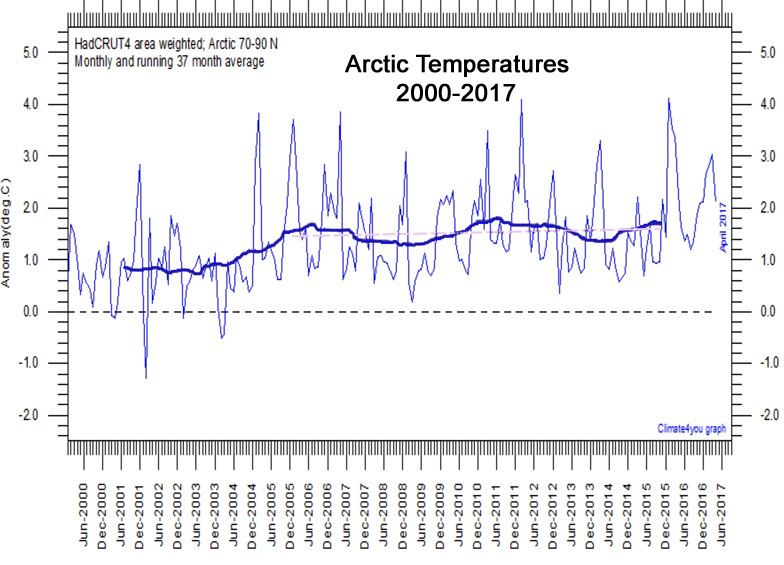 Since mid-2005, the Arctic temperature trend has stabilized, with no significantly detectable warming. 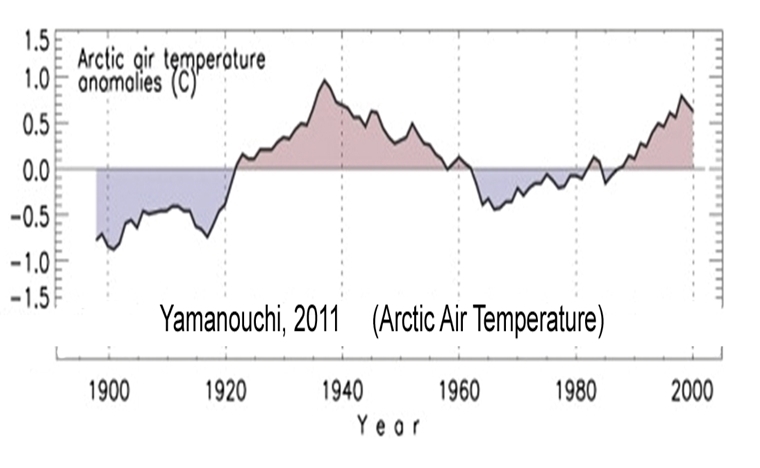 When viewed from a longer-term context, the current Arctic temperature trends are not unusual. 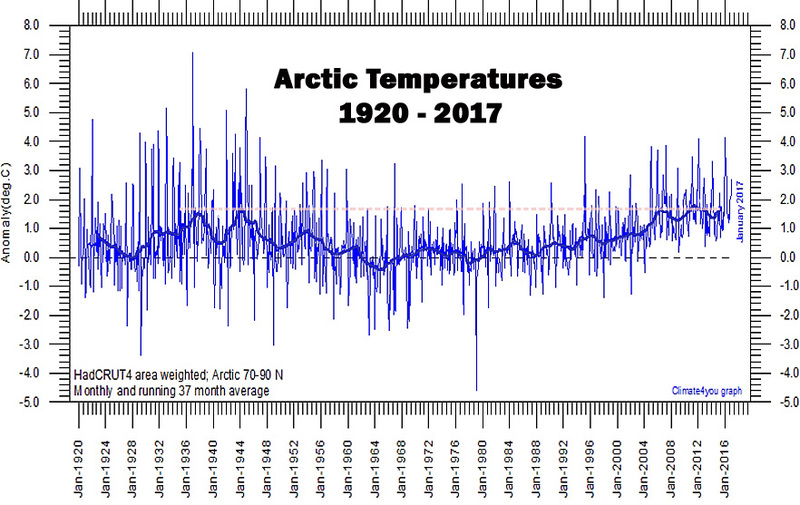 In fact, the warmth of the last 12 years was matched during the 1920s to 1940s, with about 50 years of Arctic cooling in between. 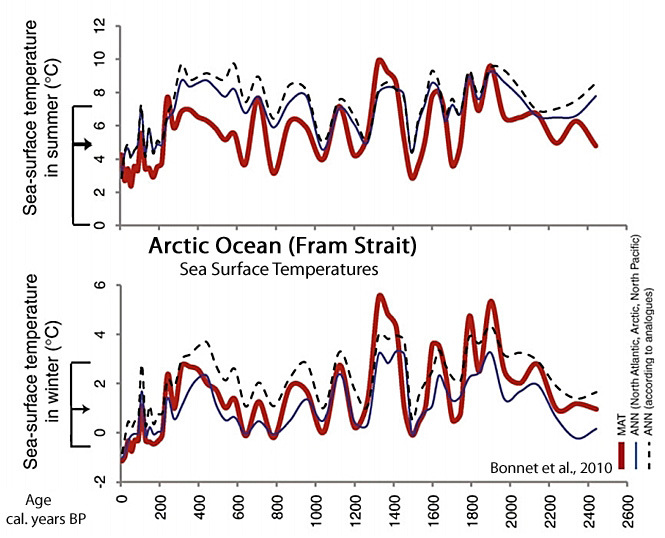 From a still longer-term perspective, not only are modern Arctic temperatures not unusual, they are still cooler than a significant portion of the last 8,000 years. And not only is the current Arctic sea ice extent not unusual, there is still much more sea ice in modern times than there was during much of the Early Holocene, when the Arctic Ocean was sometimes ice-free during the summer months. MASIE shows a similar very slight increase. Pity, because the people living up there could use sea ice levels nearer the much lower Holocene average. A further decrease, back to the smaller extents of before the LIA, would have great benefits for travel, commerce, fishing etc etc. I recently (early March iirc) did a pixel count of “old ice” from the Russian sea ice charts. These go back to 2008 in a constant compatible format and scale. 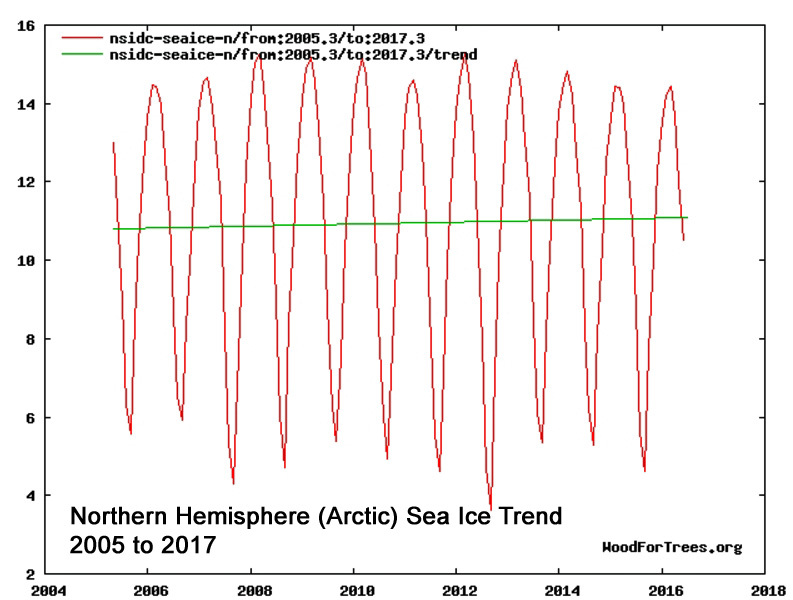 They show a clear increase in “old ice” since 2008. 2013 was low because of a large storm the year before. Kenneth , a point to note. You have to be really careful with linear trends on cyclic graphs. The start and end points within a cycle can have a very district effect on the trend calculation. This NSIDC trend graph is more correct, although I haven’t updated it for 2017 yet. Of course, using just the peaks is an anti-science, low-knowledge method, because the peaks and troughs are very often affected by WEATHER events, like the trough at the end of 2012 (large storm), and the peaks and troughs of 2015-2017 (very strong El Nino effects)were. The first comment from you in a long time that actually makes sense and doesn’t use your usual language. What have you done to our AndyG55 imposter? Poor seb STILL resorts to the 1979-now data. Yes, bozo, we KNOW there has been a highly beneficial drop in Arctic sea ice since the extremes high in the late 1970’s, as part of the NATURAL AMO CYCLE. You KNOW we are talking about the last 10 or so years..
… so why be SO DECEITFUL. Deceit is a form of LYING, seb.. and seems to be inbuilt into your persona. You KNOW we are talking about the last 10m or so years..
Poor propaganda parrot, every time you try some puerile stunt, you eat more sock. 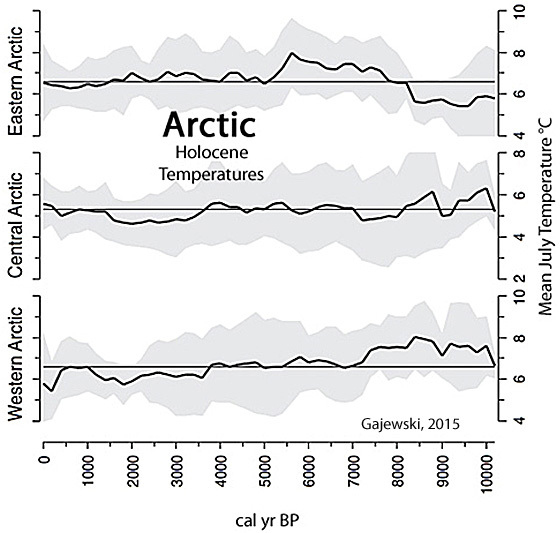 Current levels of Arctic sea ice are higher than they have been for 90-95% of the Holocene. Your continued DELIBERATE and WILFUL IGNORANCE of natural ocean cycles is becoming a very low end comedy act.. even a stunned monkey would be more appealing and intelligent. Arctic sea ice as been essentially level with a slight increase over the last decade at least, totally in line with the natural AMO cycle, which peaked in about 2006/7. Your first graph shows , yet again, that you have absolutely NO IDEA what you are doing or what the data is. Your IGNORANCE increases exponentially day by day. I wonder just how much cherry-picking you had to do to fabricate the WFT graph. You really should stay away from things you know NOTHING about.. it degrades even the least intelligent AGW suckophant. And , from your pathetic attempt on WFT, basically IMPOSSIBLE for someone with your low-end junior high maths non-skills. I do have to wonder if you have a 3 year old child who produced that load of garage, because it does not come from a rational or intelligent mind. I purposely never told you what you are doing wrong, and I’m not telling you now. You will just have to keep muddling along like a stunned numbat, making more and more of a fool of yourself. Please tell us… Why do you LIE INCESSANTLY.???? Artic sea ice hasn’t been level. And when 2006/2007 was the “turning point” … what was the 2012 decrease then? An outlier? Using just the last 10 years to show that the average didn’t decrease in a graph like this (http://www.woodfortrees.org/plot/nsidc-seaice-n/last:1000/to:2016.42/compress:12) is just wrong for obivous reasons. I greated this graph (http://imgur.com/a/an666) from your claim that the DOE data shows an extent of 6-7 million sq. km while current extent is 11-12 sq. km. So combining both charts with that in mind results in what you see… is that not your claim? So both versions are wrong now? 😉 How do the red and the black graph then combine? I can’t help it if you are WAY TOO DUMB to see your mistake. You are not here to learn, but to disrupt. I am not here to teach you. and we can all enjoy your comedy act. And yes seb.. Both versions of your graph are still MORONICALLY WRONG and indicate you haven’t got the slightest clue what you are actually graphing. The mid-late 1970’s EXTREME Arctic sea ice shows up clearly on the Icelandic sea ice charts. In line with UNADJUSTED NH temperatures (we have very little real temperature info from the SH before the satellite era), the late 1940’s were about the SAME TEMPERATURE as now. That means that there has been NO WARMING WHAT SO EVER from the highly beneficial increase in atmospheric CO2. That means that the climate sensitivity to CO2, must be zero or close thereto. All this waste of money on “unreliables” and the massive destruction of developed countries’ electricity systems has been FOR NOTHING, based on LIES and MISINFORMATION. The Climate AGENDA is one of the biggest SCAMS ever perpetrated on mankind. An excellent post Kenneth Richard. Hopefully this post will help ‘those who will not see’ get a better sense of both perception of natural variation, and an improved perspective of what nature does over the long term. Hopefully they will see how foolish is their belief that human CO2 generation can control the climate, as this small list of Arctic observations and modeled possibilities show such an idea is both banal and illogical. I dare say this will not fully convince them, as their rationality is overwhelmed by a banal pseudo-religious belief that human generated CO2 in the atmosphere is significant driver of the climate despite an absence of proof, and their illogical belief that correlations are as meaningful as causation within the quasi-stable periods of our chaotic climate system. Perhaps I will again be accused by ‘those who will not see’, of believing in a “big conspiracy” in order to dismiss my comments and to protect their demented thinking from being tainted by either reality or rationality. They max out on stupid when it comes to the Antarctic, as well. However, these studies ignored the impacts of forests on atmospheric aerosol. We use a global atmospheric model to show that, through emission of organic vapours and the resulting condensational growth of newly formed particles, boreal forests double regional cloud condensation nuclei concentrations (from approx. 100 to approx. 200 cm−3). Using a simple radiative model, we estimate that the resulting change in cloud albedo causes a radiative forcing of between −1.8 and −6.7 W m−2 of forest. This forcing may be sufficiently large to result in boreal forests having an overall cooling impact on climate. We propose that the combination of climate forcings related to boreal forests may result in an important global homeostasis. In cold climatic conditions, the snow–vegetation albedo effect dominates and boreal forests warm the climate, whereas in warmer climates they may emit sufficiently large amounts of organic vapour modifying cloud albedo and acting to cool climate. I wonder, have any of you seen the television program about the ice airport up there? They fly in with a Russian built wing blowing jet. They ferry a lot of people to the north pole by various means of transport. Fascinating stuff. Seems to be no shortage of ice!! I tried html code a couple of times here , but it never seems to work for me. Is there a page where I can get further instructions as to how this particular forum works? I just now tried to send instructions for quotes, bolds, and italics, but each time the code was hidden and the function quoted, emboldened, and italicized. So I’ll try again now. Before and after each word, there is a less-than symbol (first) and a greater-than symbol (end), substituted visually with a * here. I can’t insert the real symbol because it’ll function when posted no matter how I try to kill it. So it is different from WordPress use were &lt b &gt is bold, del is used instead of ‘strike’ to cross out a remark. Ho-humm lots more to try and learn. So it is different from WordPress use were < b > is bold, del is used instead of ‘strike’ to cross out a remark. Looks like everything except the pre and the ins tag works. The shortform quote tag (q) doesn’t seem to have a speciel formatting in this theme and appears as normal text. The source of a citation is also not displayed. On this site not all the WordPress style tags work. The blockquote does work normally. I’d like to know how Kenneth R gets BOLD. What works for me elsewhere doesn’t work here. Bold and italics are different from WordPress usage. text modifiers that insert the correct codes around highlighted text. Useful for making a comment, any chance of doing the same here Pierre? (Or maybe I just make-up the comment there and cut and paste it to here). In the last ice age when glaciers covers asia and the US, Arctic ice was about the same as today with seasonal melting. 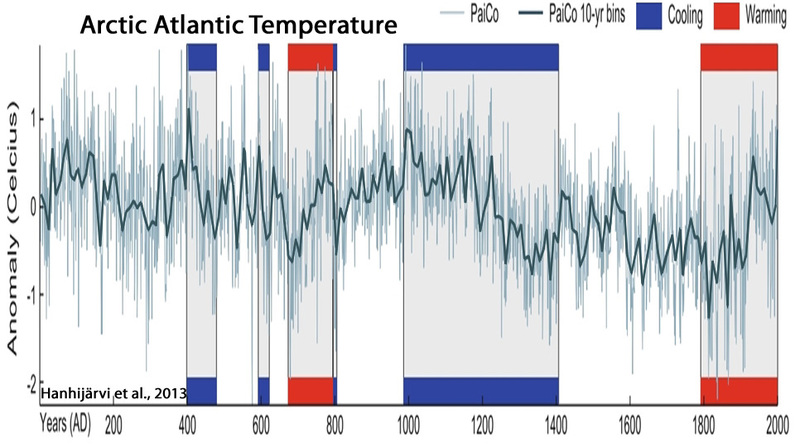 It will be interesting to see the next few data points on climate4you North Atlantic plots. The AMO is turning downwards. NH temps should start to drop and, unfortunately, the NH sea ice levels will probably start to increase, much to the detriment of the people living up there.